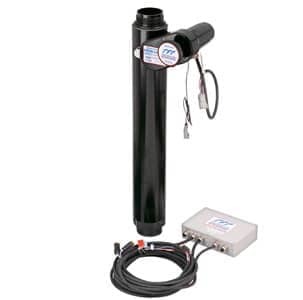 The Extend-A-Gun series provides new capabilities for your deck mounted Master Stream device. For storage, it can be lowered to deck level (or even into a monitor well). On the fire ground, the monitor may be raised to its extended position 12 or 18 extra inches (30.5 or 45.7 extra cm) above the trucks pump housing. The Extend-A-Gun offers a hardcoat anodized finish, and built-in sensor for connection to “monitor raised” light or truck open compartment warning. It can be specified with new, or retrofitted to existing apparatus. Models include a manual version with a 3” (75mm) waterway or a remote control version with a 3” or 4” (75mm or 100mm) waterway. This gives greater clearance of other equipment on the apparatus, greater freedom of movement, and keeps firefighters off the top of the trucks, thus providing a safer operating position.